Over the past quarter century, crude-looking stamps on very clean, attractive covers, like that in Figure 1, have appeared in the philatelic marketplace. Back in the mid-1980s, there was a controversy in the Indo-china Philatelist about the status of these stamps. Were they fake? Were they fantasies? Back then, the SICP leadership was of the opinion that if articles are not written comparing real stamps with fakes, the forgers would not know how to make their products more correct. But the issue has dragged on long enough and I decided to resolve this issue once and for all. Figure 1. Example of a "too good to be true" cover. I spent March 2001 in Vietnam studying the local philatelic scene. I saw more fake items than I ever thought possible. Some dealers told me that they were real while some collectors told me that they were fakes made in Hanoi. These covers sell on eBay or at stamp shows for $300 to $1,200 apiece. There have been auctions featuring hundreds of them offered at one time. 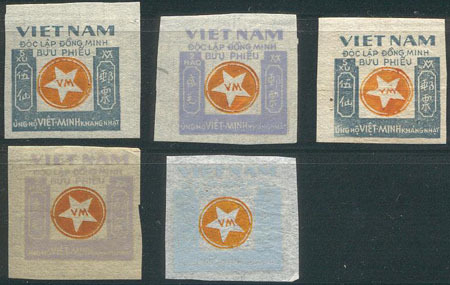 Figure 2 shows a number of fake stamps, all sold as the local issues of Lien Khu 5 (Interzone 5). I brought color scans of a few covers to the offices of Tap Chi Tem, the official publication of the Vietnam Stamp Association. There, the editors had reference copies, which I was allowed to examine. Once you have had an opportunity to handle the real items, you will never be fooled again. The differences in paper, spacing of letters, etc. are very pronounced. I tried to find the source of these fakes, and was told to look "in Hanoi" but nothing more specific. Figure 2. 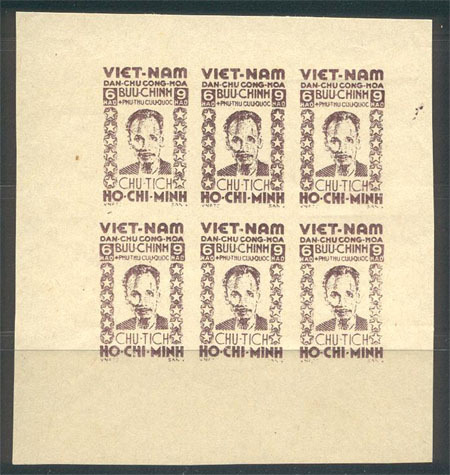 Fake LKV stamps span a wide range of Ho Chi Minh varieties. Later during that trip, I learned that the forger is (was) a retired Viet Minh soldier who had been a fighter in LK5 during the war against the French. He was disabled, and given a job in the History Museum in Hanoi after the French defeat. Sometime before 1975 (1975 is when his fakes were first sold outside Vietnam in Europe and the United States), this veteran used his time in the museum to learn about the names of the party members, their families, addresses, etc. The fakes were produced along with postal markings and cachets. I also learned that the forger died around 1997. My search appeared to be at an end. Figure 3. 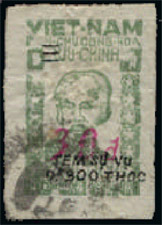 Genuine LKV stamps are scarce. My next trip to Vietnam took place in June 2001. At a local stamp club meeting, I learned that the forger's son-in-law in Hanoi was running the LK5 business. His name was "Mr. Smith" which is obviously not his real name. Le Anh Thu and I went to Hanoi to find Mr. Smith. After talking to many of the leading collectors, we found that Mr. Smith lived in a "bad" part of town and that there was no address! A rough map was drawn and we went to a distant part of town to begin the search. The neighborhood was about an hour or more from the Old City section. We walked down and asked about Mr. Smith or "the man that sells his father's stamps." Eventually, we found the home of the widow who sells fake stamps but was not home. A child there directed us to another house. With a high wall and an iron gate, the house was large by Vietnamese standards - large even by American standards. Mr. Smith invited us in after we mentioned the names of some dealers in Saigon. Mr. Smith was very shy about his operation and material. Initially, he did not seem to want to show much of it. He brought out a few items and I bought some at $5 a stamp. 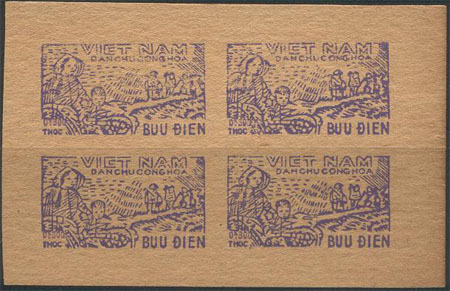 I knew the Saigon dealers only paid $3 per stamp and was told next time I come I will get a better price. I even managed to get sheetlets of LK4 and LK5 stamps. After about an hour, Mr. Smith brought out two large stock books filled with fakes. There were rows upon rows of fakes. 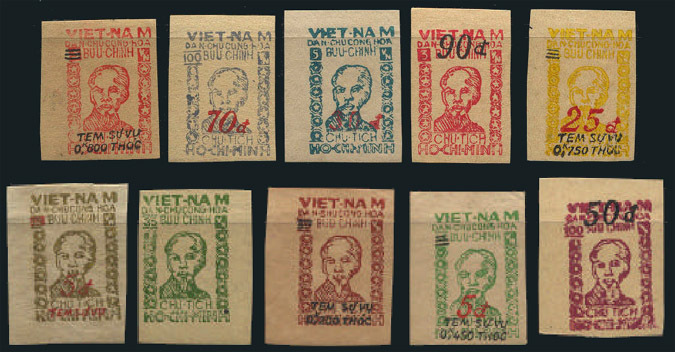 Besides the Lien Khu stamps, there were many fakes of the early North Viet Nam issues, including the Mac Thi Buoi issue of 1956 plus the unissued stamps for the Russian revolution (Michel I) and the Korean Flying Horse (Michel II). We all talked about stamp collecting in the United States and Vietnam and eventually left. It had been a very satisfying day. The forger had been found and these covers proven to be fakes. 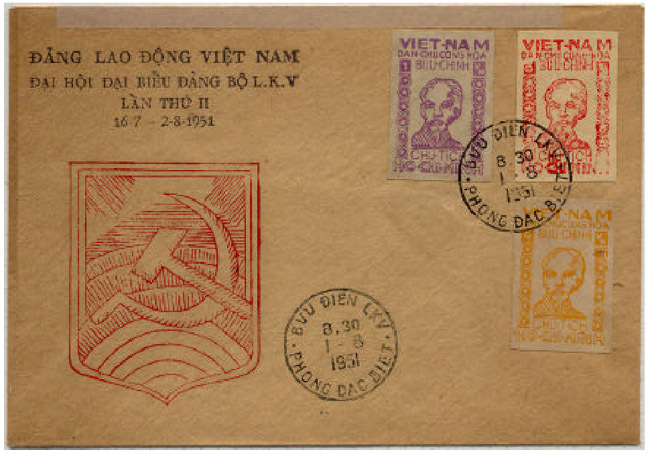 Author's Note: In cooperation with Dr, Peter Corson, I am preparing a comprehensive listing of the fake material plus related items translated from the Vietnamese philatelic press. We hope to offer the compilation as a CD-ROM through SICP. Editor's Note: Due to space limitations, some of the scans didn't make it into the Indo-china Philatelist. Images of these additional fake stamps are shown below.